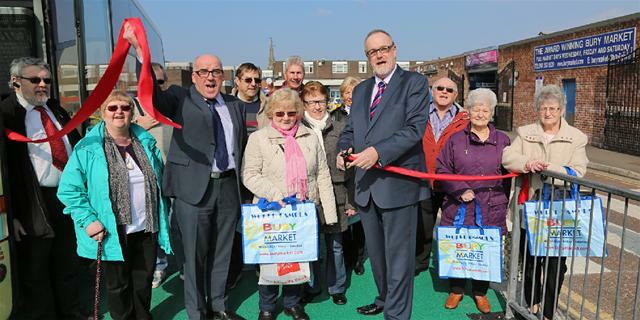 Visitors to the award-winning Bury Market will now find it even easier to enjoy their time at this famous attraction. A new drop-off point for coaches has been built which means shoppers will arrive right on the market's doorstep rather than having to cross the road from the Market Street Coach Parking area. The facility is open to all coach drivers who book a time slot prior to their visit. The drop-off area can be found opposite the Markets Management Office, and all coach drivers who visit the markets office and register will be given a £5 lunch voucher that can be redeemed at nine cafes on the market. Bury Market is a huge tourist draw, bringing coach loads of visitors from across the country. Last year the market welcomed more than 1,500 coaches, and has won awards for its facilities for coach operators. Markets manager Andrew Heyes said, "Bury Market is rightly called the town's 'jewel in the crown' and we want to do all we can to give visitors a great day out. We are pleased to offer this new drop off facility to drivers and visitors alike, and we expect that this convenient drop off point will be well used over the coming months. In addition we have recently installed new public toilets and an ATM on the market, and hope these latest investments will make it even easier for visitors to come back again and again to our famous market." Pictured: Leader of the Council Cllr Mike Connolly and Chief Executive Mike Kelly greet coach visitors.